Somehwhere along the line the American Schools of Oriental Research (ASOR) were apparently assimilated by Buzzfeed, but their "Can You Identify These Near Eastern Languages?" is a nice challenge. Hint: Number 10 is not Near Eastern at all. At least in our world. I got 10 out of 10. Can you? It is proving to be another violent Ramadan, with violent jihadi attacks in Kuwait and Souuse and Grenoble, and today's assassination in Cairo. 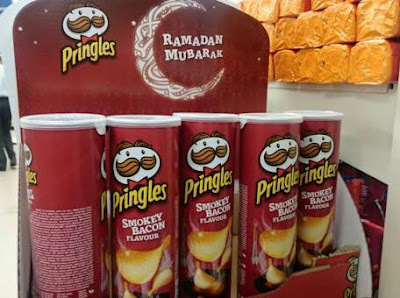 Ramadan is meant to be a month of peace and reconciliation, and warring Muslim states have sometimes held cease-fires during Ramadan, but in fact there is no outright prohibition on fighting during Ramadan, a fact jihadists use to step up violence in what they see as a holy war against those they see as enemies, even their fellow Muslims. The assassination of Egypt's top prosecutor, Public Prosecutor Hisham Barakat, in Heliopolis today marks the first successful assassination of a senior government official since the crackdown of 2013. Although here have been attacks on police, security forces, and judges, the killing of Barakat marks a new threat to the most senior levels of stat power, and following terror attacks over the weekend in Kuwait and Sousse in Tunisia, is the latest violence in what is emerging s a dangerous Ramadan. I'm not sure where this photo was taken, but I don't think they have the right target demographic. Egypt has announced plans to issue a commemorative stamp to honor the opening of the "New Suez Canal" project, expected August 6. Artists are competing for the design. 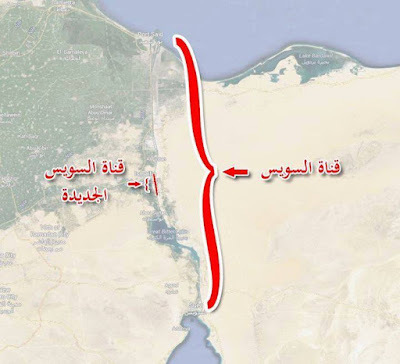 The Suez Canal is a sea level canal. It does not have locks. The lock shown is in Panama. Large bracket on right, The Suez Canal. 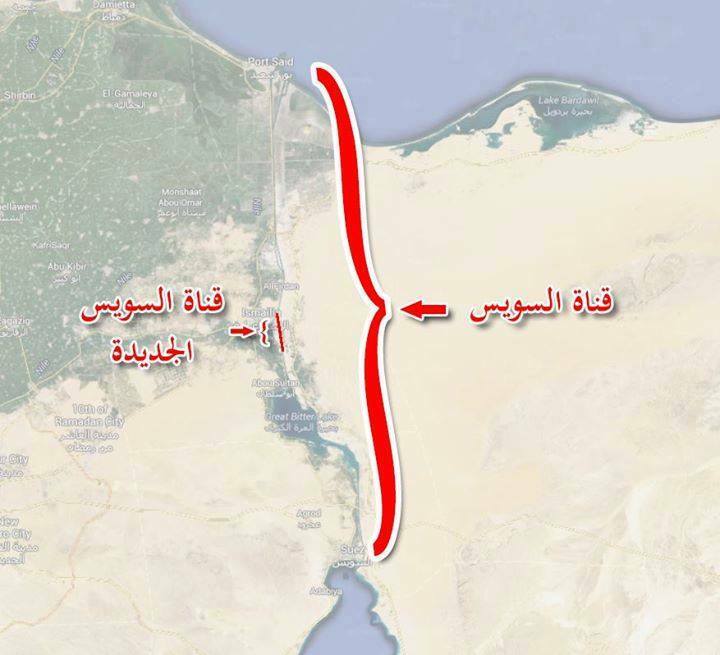 Small line at left, the "New Suez Canal." The graphic is a bit unfair as it doesn't include areas being dredged and expanded or other improvements. Predictably, the Internet pounced, with people posting pictures of the horrors of the Syrian war. Some examples appear in articles by The Huffington Post, The Washington Post, and Al Jazeera. A useful list: "11 Essential Digitized Collections for Middle East Historians." It isn't just the Druze of Israel and the Golan who are alarmed by the attacks by Jabhat al-Nusra on the Druze of Syria, but so far the Syrian Druze seem more intent on defending their threatened territory rather than seeking support from the Asad regime or Israel. Usually irrepressible Lebanese Druze leader Walid Jumblatt initially responded to the massacre of Druze villagers in northern Syria. Jabhat al-Nusra reportedly executed at least 20 Druze civilians in the northern governorate of Idlib, an area without a large Druze population. But the killings raised alarm in the more heavily Druze southern governorates of Sweida and Dar‘a. 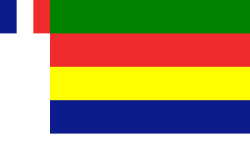 Sweida is heavily Druze and Dar‘a, where fighting has been heavy since the outbreak of the war, has a substantial Druze population as well. Sweida governorate is the region of the Jabal Hawran, also known as the Jabal Druze. Both Sweida and Dar‘a governorates adjoin the Jordanian border. Irrepressible Lebanese Druze leader Walid Jumblatt initially called he massacre an isolated incident, and told a press conference, "We don’t need Assad or Israel. Both of them take a sectarian stance with the aim of perpetuating sectarianism and dividing the country.” But he also flew to Jordan to meet the King and intercede for the safety of Druze refugees in Jordan. Both Sweida and Dar‘a adjoin the Jordanian border. Syrian Druze, like Syrian Christians and ‘Alawites, have traditionally supported he regime as a protection of minorities against Sunni jihadis. While some Druze leaders have continued to urge Druze to enlist in the regime army, others have said Druze fighters are absolved of responsibility to the regime and should defend their own home villages. Whether we are returning to those days, with separate Kurdish, ‘Alawite, and Druze enclaves, or simply towards collapse into anarchy, remains an open question. Twice today there were reports of attacks by Golan and Israeli Druze against Israel Defense Forces (IDF) carrying wounded from the Syrian civil war, The first attack occurred in the upper Galilee Druze town of Hurfeish, leaving one local Druze wounded. The second attack, near Majdal Shams in the Golan, reportedly involved a crowd of 150 and left one Syrian soldier dead and several wounded, including the Israeli driver and doctor. The incidents come amid growing tensions among local Druze in the Galilee and Golan, concerned about attacks on their fellow Druze inside Syria by yhe jihadist Jabhat al-Nusra. Since the United Nations Disengagement Observer Force (UNDOF) was forced to withdraw last fall from the buffer zone to the Israeli forward line of control, both the IDF and the UN peacekeepers are essentially on the front line of the Syrian civil was. Reeent background pieces in The Washington Post and the Irish Times (many of the UN peacekeepers are Irish troops) have dealt with the growing tensions as the Golan Druze demand protection for their Syrian co-religionists, many of whom have family ties across the disengagement line. Apparently the attacks on the ambulances were insire by fear that the wounded Syrians were Jabhat al-Nusra, though the Israeli reports seem to imply they were regime soldiers. Isral has regularly been treating Syrians wounded in the civil war in field hospitals in the north. The growing danger that the fighting in Syria could spill into the Golan (or into Jordan), makes the Golan front a dangerous one. Wikileaks claims it is posting "more than half a million cables" from the Saudi Foreign Ministry, doing to Saudi Arabia what they previously did to he US State Department. Press release here. The first 70,000 were released today, and there's a search page here. The first few documents I've seen were OCRed, and seem to be either garbled or hard to read; they're in Arabic of course. I'm on deadline so blogging will be light for a few days longer. Ramadan will begin at sundown tonight and the fast will begin at dawn tomorrow in the US and most Middle Eastern countries that follow the Saudi determination. 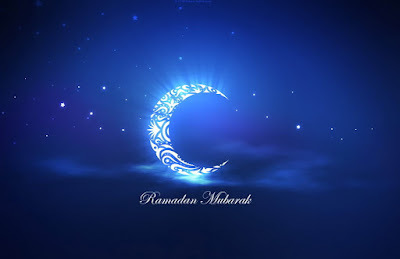 Ramadan Mubarak wa Ramadan Karim to my Muslim readers. Süleyman Demirel, many times Prime Minister of Turkey and ultimately its President, has died at the age of 90. As head of the Justice Party and later the True Path Party, he served as Prime Minister 1965-1971 (deposed by military coup, sporadically for several terms in 1975-1980 (again deposed by military coup), mostly alternating with the Republican People's Party's Bülent Ecevit, and finally from 1991-1993. 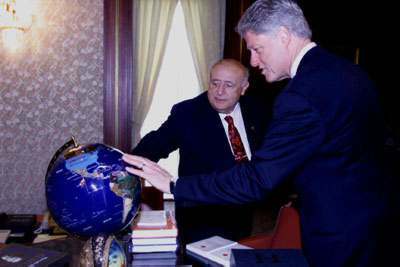 From 1993 until 2000 he served as Turkey's 9th President. I'll let my Turkish readers judge Demirel's legacy. Coming soon after the recent death of Kenan Evren, and the recent elections, it is also a reminder underscoring how Turkey has changed since the seventies and eighties. The capture of the Syrian border town of Tal Abyad from ISIS by the Syrian Kurdish People's Protection Units (YPG), combined with the previous fall of Kobane and other border areas, is a real setback to ISIS and threatens its source of international fighters reaching Syria via Turkey. 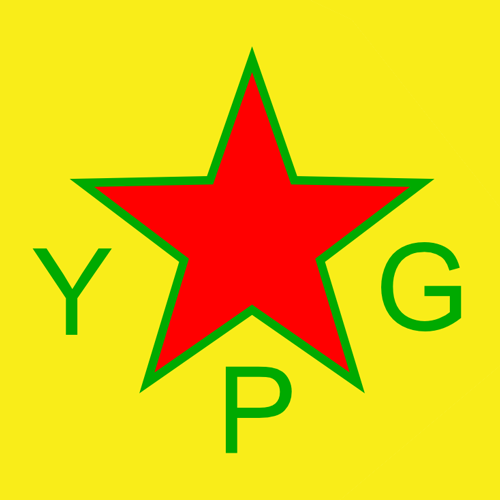 The victory has also increased the flight of Sunni Arab refugees into Turkey, leading to charges by some Arab fighters that the YPG is ethnically cleansing the area; the YPG denies this and has urged the refugees to return. Turkey is also concerned, both due to the renewed influx of refugees, and because the YPG's parent party, the Democratic Union Party (PYD) in Syria, is affiliated with the Turkish Kurdistan Workers' Party (PKK). The Kurdish front against ISIS gets little coverage in the West, and what does get covered is mostly reported from Erbil in Iraq's Kurdistan Regional Government (KRG)-controlled areas. But the YPG is slowly capturing the Syria-Turkish border region of northeastern Syria (which Syrian Kurds call Rojava) from ISIS. On a lighter note, I just learned Blogger's spellchecker does not include the city of Erbil in its dictionary. It suggested "gerbil" instead. I recently came across a nice little study of language attitudes among Kabyles in Oran, inheriting Kabyle from their parents and kin but living in an overwhelmingly Arabic-speaking context: Ait Habbouche 2013. The results will not come as a huge surprise to anyone familiar with Algeria, but they stand in stark contrast to a curiously widespread idea about Berber language endangerment: the notion that Berber is under threat from the government-imposed hegemony of Standard Arabic. What the survey answers reveal, time after time, is in fact the utter failure of government policies to create any meaningful space for Standard Arabic in daily life. It is no surprise to see that Standard Arabic is used by 0% of respondents with other Kabyles in the cafe or at home. But seeing that only 4% speak it even at work, and 0% in university, should be a shock to anyone who still imagines that Standard Arabic occupies a position analogous to, say, Standard German. The taboo on speaking Standard Arabic in any but the most formal quasi-academic conversation remains nearly absolute; 73% rated it as the language they used least. The only topics surveyed for which this option was selected by any significant number were religion and politics, and actual usage in both cases would probably reveal a mix of Standard words into a basically dialectal matrix. There are absolutely no signs that this group is shifting to Standard Arabic, or even sees this as a viable possibility. The language that has attained a large usage among these speakers, even with other Kabyles, is not Standard Arabic but Algerian Arabic - a language with no official status taught in no school, which was the least likely (2%) of any of the available languages to be rated as most beautiful or richest, and was rated by 42% as the language they liked least (nearly tied with Standard Arabic). Yet this little-loved language, dismissed as much by its speakers as by their rulers, is not only the main language they use with non-Kabyles but is extensively used even with fellow Kabyles (42% with their own siblings). Ramadan starts this week, very close to the longest day of the year, and a debate that arises from time to time has cropped up again, as one British Muslim scholar suggests following Mecca times for Ramadan in northern Europe, where the days can be extremely long in summer. Something similar is practiced by Muslims north of the Arctic circle, where the sun never sets in high summer, and was also the case for the Saudi astronaut aboard the space shuttle some years back, when sunsets were about 90 minutes apart in orbit. Blogging has been sparse due to deadlines, but I should say something about the attempted suicide bombing at the Temple of Karnak. Egypt's tourist industry has been struggling to revive since the revolutionary upheavals of 2011-2013, and this presents a tempting target to radical jihadis. Just recently there was an attack on tourist police near the pyramids, and now this failed suicide bombing at Luxor's Temple of Karnak. No tourists were injured, but reports say some police and shopkeepers were wounded. The attack on foreign tourists at the Temple of Hatshepsut at Deir al-Bahri in 1997 (just across the Nile from Luxor) killed 62 people 58 of them tourists, and remains the worst attack on tourists to date, though there have been others, especially in Sinai. I suspect this will not be an isolated case. "Water cannon producer’s stock dips after Turkey’s ruling AKP loses majority." The largest supplier of police water cannons in Turkey has seen a steep fall in its stock prices, hours after the ruling Justice and Development Party (AKP) lost its parliamentary majority. Shares in Katmerciler Ekipman, the company that manufactures the riot control vehicles popularly known as TOMAs, decreased 10 percent early June 8. The main news on Saturday was the victory of thoroughbred American Pharoah (officially so spelled on his registration, so racing fans will never spell "pharaoh" correctly again) in the Belmont Stakes, making him the first horse in 37 years to win the Triple Crown. You may already know that he is owned by Egyptian-American businessman and breeder Ahmed Zayat. I thought it worth mentioning that Zayat (besides identifying himself variously as both Muslim and an Orthodox Jew; a Yeshiva graduate and living in an Orthodox neighborhood in Teaneck, New Jersey) used to run Egypt's Al Ahram Beverages Company, which among other things brews Stella Beer, a number of other beers, and produces Gianaclis wines. Al Ahram beverages had been nationalized under Nasser and its quality control suffered; when it was privatized in 1997 Zayat and a group of investors bought it, expanded its product line (including a non-alcoholic beer) and improved quality control. In 2002 the company was sold to the Heineken group, though Zayat remained involved in its management until 2007. So if you have access to a bottle of Stella, raise a glass to a record-making three year old thoroughbred with a misspelled name. 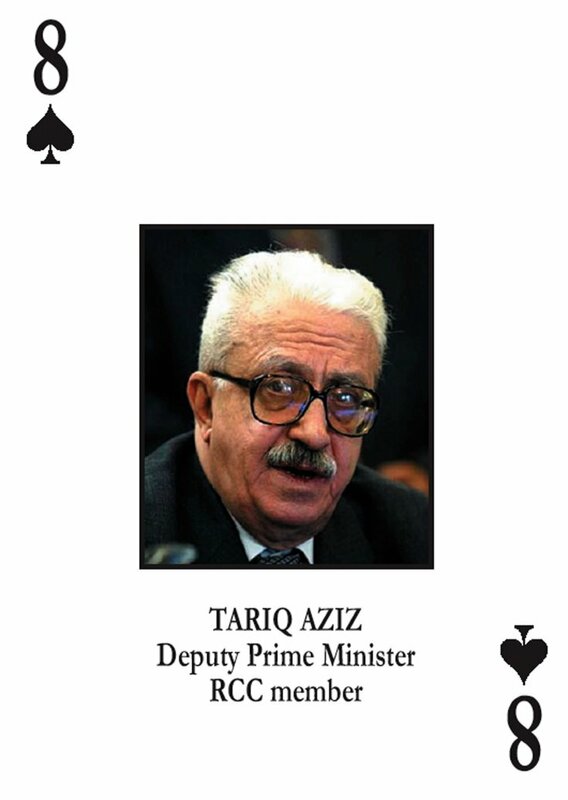 Tariq ‘Aziz, who has died at the age of 79, was Saddam Hussein's longtime Foreign Minster and Deputy Prime Minister, and thus was the public face the Saddam regime showed other countries. If many found him more acceptable and less blood-soaked than his colleagues, that was certainly why he was the public face; he was still the regime's key apologist. ("He wasn't quite as monstrous as all the others" is not really an epitaph anyone wants, though.) Though sentenced to death after the fall of the regime, he was not executed. He suffered a heart attack in prison and died after being taken to a hospital. Born Mikhail Yuhanna, he was the highest-ranking Christian in the regime, a Chaldean Catholic (though I rather suspect not a regular churchgoer). I note his passing, but will not say RIP. It's another June 5, the anniversary of the event from which so much of modern Middle Eastern history stems: the 1967 War. As I'm rather busy, it seems best to simply link to earlier posts on that warm, of which there have been many. A very busy day so not much blogging. I'm not that big a basketball fan unless my alma mater or a local pro team is involved, but with the NBA finals underway, I should note Haaretz' piece "Middle East veterans to meet in NBA finals." During the Paris peace talks, on Sunday, December 1, 1918 during a meeting at the French Embassy in London, by David Lloyd George's own account, Georges Clemenceau asked him what he wanted, and Lloyd George immediately replied, "Mosul." Clemenceau then said "You shall have it. Anything else?" To which Lloyd George responded "Palestine from Dan to Beersheba," (or in another version, "Jerusalem.") (Much of Palestine was supposed to be under international control under Sykes-Picot.) Clemenceau, who wanted British support for French claims in the Rhineland, quickly agreed. The rise of the Turkish Republic undermined the hopes of Italy and Greece for carving out their shares, and the Treaty of Lausanne and the results of the San Remo Conference had far more than the Sykes-Picot agreement to do with the modern borders, which continued to change at least as late as the 1939 transfer of the Hatay to Turkey. Marc Lynch, "Rethinking Nations in the Middle East," at The Monkey Cage. This is both a useful essay in its own right and a justified plug for a new POMEPS study called "Rethinking Nations and Nationalism," based on a symposium Marc and Laurie Brand convened earlier this year. 'Lines Drawn on an Empty Map': Iraq’s Borders and the Legend of the Artificial State (Part 1) by Sara Pursley at Jadaliyya. Along with Part 2 here, this is one of the best takedowns I've seen to the "Iraq is artificial" theme. The maps alone are wonderful, And if anybody in the field isn't already reading Jadliyya regularly, it's a great reminder of why you should be. This week, Cairo began demolishing one of the most familiar buildings along the Nile Corniche, the former headquarters of Husni Mubarak's ruling National Democratic Party (NDP). 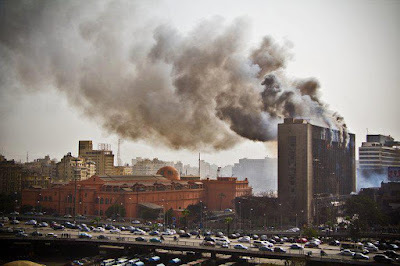 The building, which had stood since 1959 between the Egyptian Museum and the original Nile Hilton (now the Nile Ritz-Carlton) was set afire on January 28, 2011, the critical "Friday of Rage" early in the 2011 Revolution. 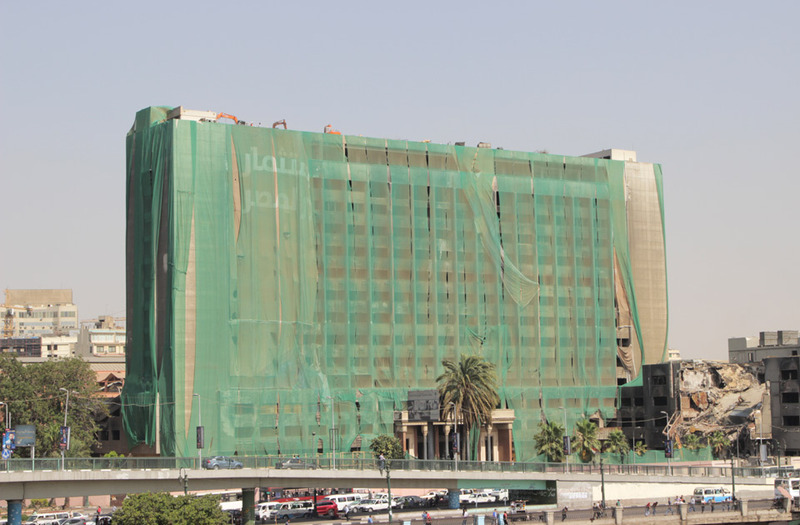 The burned-out hulk has stood there ever since as its future was debated; lately the facade had been covered with a hanging touting Egypt's new development efforts. This week it finally came down. As Zeinobia notes, some had hoped to keep it as a visible reminder of the Revolution, but that didn't happen. 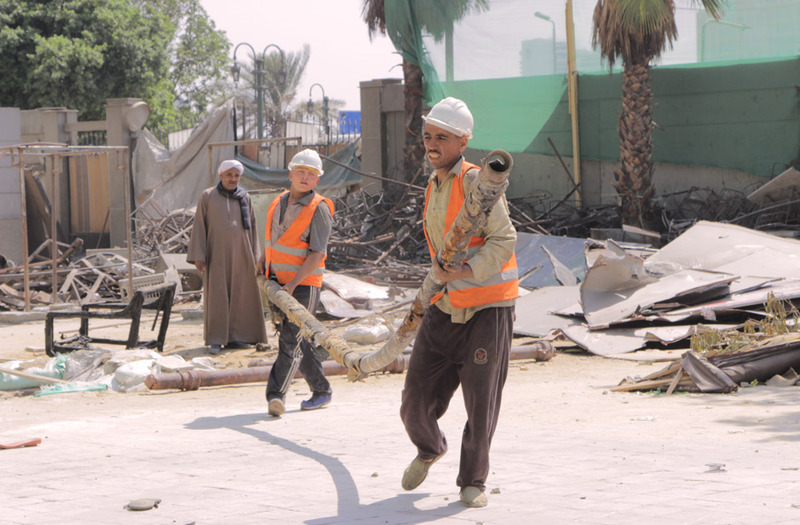 Ahram Online has a photo gallery of the demolition, from which the two photos below are taken. Originally built in 1959, it was, like the Nile Hilton and the Arab League, built on the site of the old British Qasr al-Nil Barracks; the new buildings represented Egypt's liberation from colonial rule. Originally intended to be the Cairo Municipality, Nasser instead made it the headquarters of his single party, the Arab Socialist Union. The ASU (which was not very Arab and only nominally socialist) morphed in the Sadat era into the National Democratic Party (which was somewhat National but never Democratic). A website appropriately called Failed Architecture has an aptly-titled piece, "Erasing the Remnants of a Revolution." 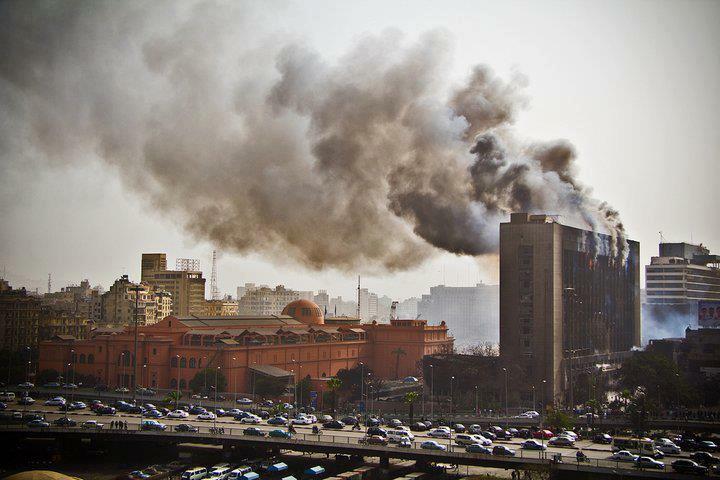 I believe officially the land is supposed to go to the Egyptian Museum for expansion. Knowing the rapacity of Cairo developers and the prime location fronting the Nile, I hope it does but plan to wait and see. YouTube has created a channel called Aflam devoted to an archive of Egyptian film from the classic era. Searchable by genre, date, title, and actors, this should prove to be good news for fans and students of Egyptian film, It's apparently been up for a few months, and I'm late discovering it; it can be accessed here. So far, there have been few confirmed reports of damage to the site of Palmyra. Video footage has documented combat-related damage to the Citadel, and unconfirmed reports suggest that several mortars fell within the Temple of Bel. The DGAM has also reported the destruction of modern plaster statues at the Museum by ISIL, and other reports suggest that at least one government airstrike hit a position within the ancient city. ISIL also posted a video and a series of images online showing various views of the ancient city, including the Temple of Bel, the Colonnaded Street, and the Theater. On May 26, 2015, a purported ISIL representative made a statement claiming that the group plans to destroy “statues” at Palmyra but will not “bulldoze” other historical monuments. Given current uncertainties about the extent of looting at the site and the state of the collection at the Palmyra Archaeological Museum, it is impossible to specify exactly which archaeological materials are most at risk. Some rumors suggest that deliberate destruction of sculptures has already begun – with the Lion of Al-lāt that stands at the entrance to the Bel Temple – but these claims have not been confirmed (and have recently been denied by the DGAM). At the same time, it is unclear whether or not ISIL will in fact refrain from harming other monuments at the site, either deliberately or for looting purposes. 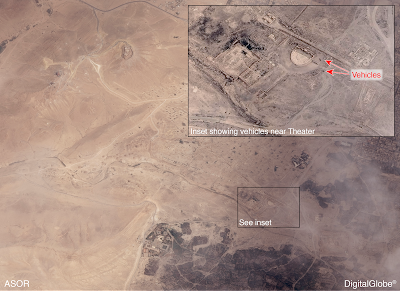 A satellite image taken on May 27, 2015, shows several trucks in the vicinity of the Theater but otherwise shows no visible damage; it must emphasized, however, that many types of damage would not necessarily be visible in the satellite imagery. Whether or not significant damage has already occurred, the site must be considered at high risk of further damage – in light of the ongoing airstrikes in the area, the potential for renewed conflict on the ground, and the possibility of looting and deliberate destruction by ISIL. 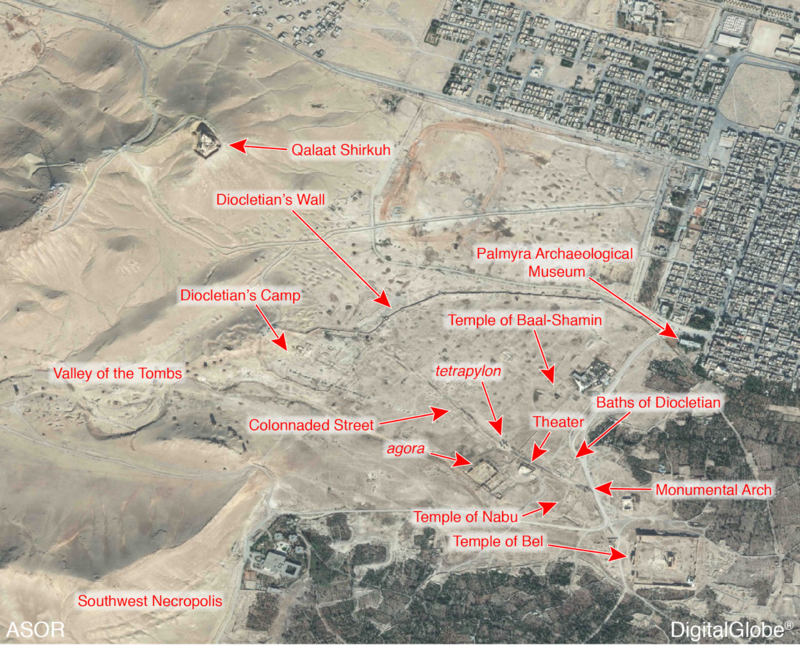 The summary provided above has shown that Palmyra is a site of significant cultural and historical importance. As part of the broader, humanitarian response to the current crisis, the international community should do whatever it can to save Palmyra. Juan Cole at his blog reproduces an article from niqash.org by Alaa Latif: "Kurdish Muslims abandoning Islam for Zoroastrianism in Disgust at ISIL/Daesh?" The original article at Niqash carries the title "The One, True Kurdish Prophet?Thanks To Extremism, Iraqis Revive Ancient Religion." For the first time in over a thousand years, locals in a rural part of Sulaymaniyah province conducted an ancient ceremony on May 1, whereby followers put on a special belt that signifies they are ready to serve the religion and observe its tenets. It would be akin to a baptism in the Christian faith. I don't know to what degree this overstates the supposed trend; it seems to be regionally localized and there are no numbers cited. And Zoroastrians traditionally do not proselytize, though that is perhaps a response to living in Islamic-dominated areas. A few side thoughts, however. 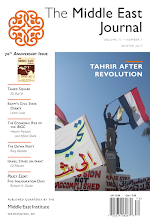 While orthodox Zoroastrianism itself has much declined in the Middle East proper there are a number of small, syncretiistic religious groups in Iran, northern Iraq, and Eastern Turkey that incorporate elements of Zoroastrian tradition, including to a greater or lesser degree the Yazidis and Shabak in Iraq, Alevis in Turkey, ‘Ali-Elahis and Ahl-e Haqq (Yarsanis) in Iran, and even the Syrian ‘Alawites, Most have secret or semi-secret doctrines and retain elements of Zoroastrianism, Mazdakism, Mithraism, or other Ancient Persian beliefs overlaid with elements of Shi‘ite or Sufi Islam. The strong influence of Sufi orders in Kurdistan (Naqshbandi and Qadiri foremost among them) also may predispose many to an openness to heterodox ideas. During the siege of Jabal Sinjar and the Yazidis, I considered writing more about these small, syncretist, heterodox groups whose links to Islam are tenuous at best, and will get to that eventually. Zoroastrian revivals are not a recent phenomenon. Babak Khorrami, who led an uprising against the ‘Abbasid Caliphate in 9th Century AD Azerbaijan, led one such movement attempting to revive either Zoroastrianism or its offshoot Mazdkism. Patricia Crone's The Nativist Prophets of Early Islamic Iran: Rural Revolt and Local Zoroastrianism is now the standard source. [Zoroastrianism] was founded by Zoroaster, also known as Zarathustra, who was born in the Kurdish part of Iran and the religion’s sacred book, the Avesta, was written in an ancient language from which the Kurdish language derives. Most linguists class Avestan as originating in northeastern Iran not Kurdistan, All the ancient Indo-Iranian languages derive fom a common origin, but modern Persian has at least as much claim as Kurdish to "derive" from Avestan. Biographical details of Zoroaster/Zarathustra/Zardusht are much disputed. The various scriptures were composed at varying times, and there is some uncertainty about dating the Prophet, even to whether he belongs in the First or Second Millennium BC. So too, there is uncertainty about his birthplace. Many older traditions point to northwestern Iran, to Azerbaijan or to Rayy in Media, near Tehran. But others point to northeastern Iran and even Central Asia, and the language of the Avesta is Eastern. The Encyclopedia Iranica has extensive treatment of the uncertainties of Zoroaster's history. In any event he represents a religious figure and culture hero to not just Persian speakers but to speakers of other Iranian languages, including Kurdish. Claiming him as a Kurd may not reflect the consensus of Zoroastrian Studies scholars, but then, there really is no consensus of Zoroastrian Studies scholars on where he was born, or even exactly when. Update: For more see Brian Ulrich's comments in the Comments, and the link.